SUMO includes some small-sized tools and tests that help to develop and evalue the implemented emission models. These tools are presented in the following. This tool generates matrices of emissions for a given range of velocities, accelerations, and slopes, given the vehicle's emission class mainly. The tool obtains parameter that describe the ranges and the emission classes to generate. If the option --iterate <BOOL> is set, emissionsMap iterates over all available emission classes. In this case, the option --output-file <PATH> should denote a folder the emission maps shall be written into. If --iterate <BOOL> is not set, --output-file <FILE> should name the file to generate and the emission class to write the map for must be defined using the option --emission-class <STRING>. If PHEMlight shall be used, one has to define the path to the CEP-files using the option --phemlight-path <PATH>. The tool is located in <SUMO_HOME>/bin. 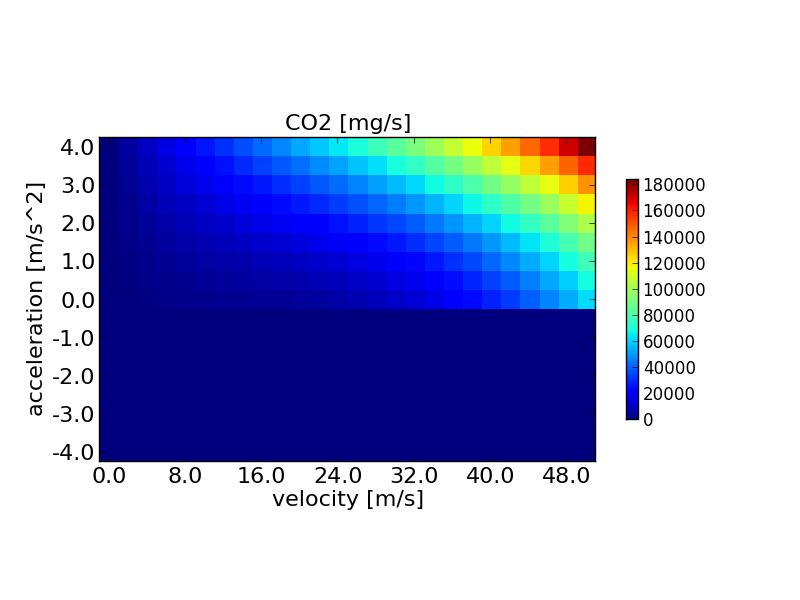 The image shows the visualisation of CO2 emission of the HBEFA v2.1-based "P_7_6" emission class. --phemlight-path <PATH> Determines where to load PHEMlight definitions from. Additionally, the sums of the generated emissions / the consumed fuel are printed on the screen. --timeline-file <FILE> Defines the file to read the driving cycle from. --netstate-file <FILE> Defines the file to read the trajectory from either in netstate or in Amitran format. --emission-class <STRING> Defines for which emission class the emissions shall be generated. --compute-a <BOOL> If set, the acceleration is computed instead of being read from the file. --skip-first <BOOL> If set, the first line of the read file is skipped. --kmh <BOOL> If set, the given speed is interpreted as being given in km/h. --have-slope <BOOL> If set, the fourth column is read and used as slope (in [°]). --slope <FLOAT> Sets a global slope (in [°]) that is used if the file does not contain slope information. --output-file <FILE> Defines the file to write the emission cycle results into. This part of SUMO was developed, reworked, or extended within the project "COLOMBO", co-funded by the European Commission within the Seventh Framework Programme.